I recently discovered Postman Pat and his little world. I'm experimenting with stop motion video using some of the figures from the series. 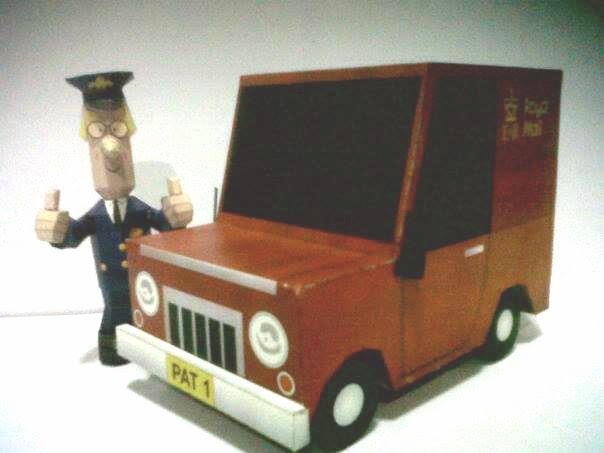 Does anyone here know of any paper models of vehicles or buildings from the Postman Pat series? I may have to attempt to design a few I guess, but finding a decent starting point/kit would be better. ... Well, I just found Pat's delivery van by a member of this site. The thread is here and his website has a PDF download for the model. How cool! The advantage of simplifying origami are twofold. Coming from the UK, can I just say, welcome to the world of Postman Pat (and not forgetting Jess, his black and white cat). I assume you are aware of other UK stop action features from the 60s and 70s -Camberwick Green, Trumpton, The Herbs to name 3. Also, from the same time as Postman Pat -Bob the Builder and Fireman Sam. If not, you're in for a treat. As for other stop-motion programs, I always loved Paddington Bear. I also remember watching an episode of Cash in the Attic where the person had the entire set and pieces from Paddington Bear that a relative rescued from a trash bin at the BBC studio. Surprisingly, no one bid on the items at all, so they kept them. My daughter used to sing along with Postman Pat. Get off me cat you're far too fat! LOL, thanks for the tips guys. Builder Bob got me started in this... looking for his truck. I missed a couple on ebay, hopefully this bid will snag one for me. Sorry, the old brain is confused... Ted Glen's truck is what I'm chasing. Last edited by NevadaBlue; 09-09-2016 at 10:23 AM.